The second installment of what will likely be a series of videos Honda will be releasing in preparation for the launch of its “True Adventure” motorcycle, or line of motorcycles, is out. On the first video Honda showed footage of the original Paris-Dakar races, videos of the motorcycles that would give origin to the Africa Twin motorcycle. Close to the end of that video they found a way to quickly connect Dakar racing with adventure riding, the road that put the Africa Twin motorcycle on the map, pun intended. And from there to “Adventure” riding and now what seems to be an important element on Honda’s marketing for this new bike: round the world travel (RTW), whatever it means. A pattern is emerging, it seems. On this second installment it is only about RTW riding, portraying mostly small single cylinder bikes (a few C90’s a couple of CRF250L’s and one exception, an old XRV750 Africa Twin). If Honda is preparing a line of “True Adventure” motorcycles, perhaps one of them will be set up for long distance travel. Perhaps it will be a single cylinder, smaller bike. Or they want you to believe a parallel twin from Honda will do it well on long adventure rides. Either way, they are drawing a path that is clearly different (…unlike the others.) than BMW’s RTW, adventure campaign with Ewan and Charlie and their travel crew and support vehicles. 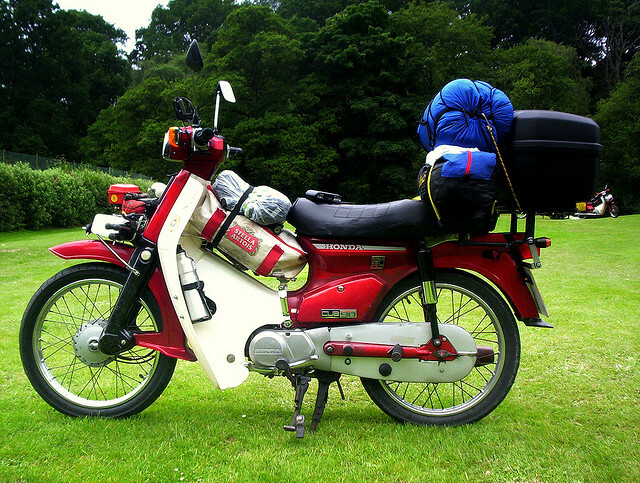 Honda C90: Small is good for RTW travel, especially for the smelling of the flowers issue. Kidding aside, small bikes are practical, some would say disposable, making travel in certain parts of the world more doable. The goal of climbing big, dangerous mountains should be to attain some sort of spiritual and personal growth, but this won’t happen if you compromise away the entire process. There is a version of this quote that Yvonne mentions in the 180 degrees South film which is a bit more colorful and there is more emphasis on the “compromise away” of the process and how it waters down the experience. You could translate that, for example, for the supported way of going round the world on a motorcycle, as in “The Long Way Round” and the “Long Way Down.” Nothing wrong with supported riding, I would say. Charlie and Ewan were very successful in what they did, and so has been BMW. Today you can hire organizations who will prepare the trip for you and guide you on the trip . It is a way to experience RTW travel on motorcycle without giving up your career. Yet. There is nothing wrong about small light-weight bikes or even large and heavy bikes which require large fuel tanks, or whatever people interpret as RTW motorcycles. RTW riding, after all, can be a soul searching type of riding, no questions about it, even if that is not what you were searching when you set out for a long trip. We all know the travelers’ quotes included in this video are cliche but we also know they are relevant, most of us would say. Having said I’m hopeful the next video installment will go back to the other side of Honda’s True Adventure: the desert racing side of it on motorcycles that are powerful, have great suspension, and go well on fast, desert riding… that, my friends, will deeply stir my soul. This entry was posted in Bike Reviews and tagged 2015 Africa Twin, Africa Twin, Honda Africa Twin, New Africa Twin, True Adventure. Bookmark the permalink. I spoke with our Honda Rep. just the other day regarding the “True Adventure”. He said that there are no plans to import the machine to the US in the foreseeable future. I asked why they would have put patents in place for a machine we won’t see. He said that Honda was leaving the door open, “in case the market changes” According to him, Honda does not believe the Adventure Bike Market in the US is not strong enough to support the bike… Not sure where they get there information??? From what I understand, this decision is not a Honda’s decision, but the American Honda dealers decision. It will also, however, depend on the bike’s passing the California’s emissions’ standards (the most stringent standards in the U.S.). Having said that, I agree with the Honda Rep., the American market is historically a bit soft on the sales of motorcycles in general, but things have been changing, including the adventure market. Saw an update from the same Honda Rep. that said we would not see the True Adventure in the US. Apparently that has changed! We will be getting it, probably as a 2016. He would not give or maybe did have any more info. except that it will be 1000cc. Thank you for the update. Glad to know we will be getting it. This bike’s international presentation has been postponed from September 2015 to November 2015. It will probably happen at the EICMA 2015.